You may not be familiar with her name, but Judy Estrin has quietly become one of Silicon Valley’s most successful serial entrepreneurs and executives. She began her career working with Vint Cerf’s research group at Stanford University — the same one that played a central role in the development of the Internet. Since the early ’80s, she has founded seven technology companies, has served as the CTO of Cisco Systems and held board positions at FedEx for 20 years, Sun Microsystems for eight years, and currently sits on the board of The Walt Disney Company (a position she’s held since 1998). Oh, and she’s also the author of “Closing the Innovation Gap” and led the team that developed one of the first commercial local area networks (LAN). While it’s been years since Estrin last paid a visit to Startup World, this past year she stepped out of retirement with the help of her son, David Carrico. In late 2011, Carrico teamed up with co-founders Alex and Jonathan Beckman to found a startup called EvntLive, a digital music venue for live and on-demand concerts that is set to launch later this quarter. Estrin tells us that, initially, she had only planned to act as an advisor, but as the business evolved over the last year, she decided to take on a larger role. While the family connection undoubtedly provides an extra incentive, the veteran Silicon Valley exec now finds herself as the Executive Chair of EvntLive (and one of its early investors) — roles that she wouldn’t have assumed if she didn’t believe in the mission, she says, or its potential to become a sustainable business. That mission, by the way, is an ambitious one: To create a scalable platform to stream live concerts ranging from sold-out arenas to intimate clubs, backed by a curated library of shows fans may have missed, integrated with social media, behind-the-scenes video and e-commerce. Based on this mission (and with help from Estrin), the startup has recruited music industry talent like Troy Carter, who has joined the team as an advisor and early investor. Carter is a well-known music manager as well as the founder and CEO of Atom Factory (a music management company), which represents Lady Gaga and John Legend, among others. He’s also an active angel investor, having invested in companies like PopChips, Uber and Backplane, to name a few. To fuel its early development, EvntLive raised $2.3 million in seed funding, as Estrin and Carter have been joined by an impressive roster of investors, including “Father of the Internet” and Google exec, Vint Cerf, Mayfield Fund partner and Glooko Chairman, Yogen Dalal, former Intel exec Dave House, Silicon Valley Connect Managing Director Ellen Levy, Tapjoy President and CEO Steve Wadsworth, Former Summit Partners director Walter Kortschak, Judy O’Brien, Jack Lasersohm, Roberta Katz and Amal Johnson, among others. Of course, while the startup’s leadership and its investor roster may be impressive, that talent means nothing if the business itself is a dud. Plus, it’s not as if the backdrop doesn’t have its own set of challenges. The music industry has changed dramatically in the last five years, fundamentally destroyed (or saved, depending on how you look at it) by digital technologies. The industry, and the record labels that once defined it, have a long road ahead as they attempt to adapt to new distribution, marketing, recording and manufacturing models — and rebuild. While the industry is still shaky, Estrin believes that the emergence of this new music industry and the changing nature of music consumption is finally creating the right conditions under which a dedicated, destination platform for live music and concerts can be successful. 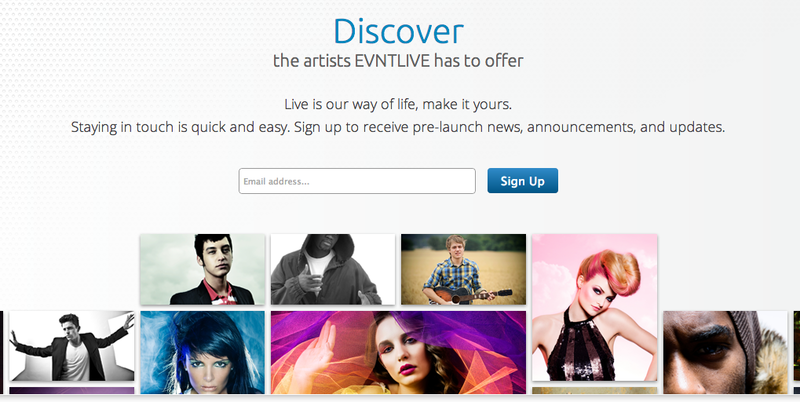 Of course, EvntLive is hardly alone in eying the potential of the live, online events space — or the first to dive in. YouTube, Livestream and Ustream, for example, each offer streaming concerts to some degree and are clearly interested in expanding their presence in the market; however, at this point, concerts are just one piece of their broad, streaming video services and far from being their only focus. Meanwhile, smaller companies like Concert Window, StageIt and Qello have also been finding traction in the space (particularly the latter). Qello, for example, offers access to a growing catalog of high-definition (mostly rock) concerts across platforms, but most notably through awesome iOS, AppleTV and Android apps. That said, Qello has focused more on building a platform around archival concerts, not so much on the live side of the business. The EvntLive executive chairman sees these startup platforms as being more “niche focused” and that by offering bigger artists, bigger venues and by combining social, interactivity and telling the story behind the show, the startup has the opportunity to build a more appealing experience for fans and artists. She also believes that EvntLive can also benefit from those macro changes taking hold of the music industry, particularly around distribution. With the scale of digital distribution channels, it’s easier than ever before for artists to get their music into the ears of listeners and tap into new (and potentially much larger) audiences. With music moving towards free, revenue growth (and profits) for both artists and businesses are increasingly coming from live performances and touring. Of course, there are limitations to this growth, as artists can only play so many venues and, in turn, venues only have so many seats. Expanding touring online can remove some of those limitations and allow the industry and its artists to add another revenue stream. In the big picture, Estrin says, the music industry has finally realized that it has to embrace digital models instead of fighting them tooth and nail, which is slowly beginning to work in startups’ favor. Of course, the evolution of the online live performance space is really just beginning, and it remains to be seen whether or not the timing is right for a platform like EvntLive. To help tilt things in its favor, the team made a conscious decision to resist rushing to market. Rather than launch early, pushing an MVP into customer’s hands right away and scramble to iterate, the team has been developing and testing the platform for over a year now. The company’s web services technology, in particular, is the product of its acquisition of Nubo9 — a software company founded by Bharat Welingkar and Matt Gloier, who previously helped lead cloud services engineering at Barnes & Noble (specifically at Nook). Nubo9 built a software platform to help develop and operate mobile APIs at scale, which EvntLive acquired last year and has since made the core of its backend technology. The platform will distribute processing to maximize performance, she added, which means that it will be able to more easily run complex algorithms in the cloud — processes that traditionally consume precious resources on the client. On top of that, EvntLive has built a cell-driven cloud architecture that aims to optimize reliability and enable efficient scaling up or down based on demand, along with cost-effective implementation that leverages both open source and pay-per-use utility computing. For the non-technical, this means that EvntLive will be able to stream hours of live music content from dozens of artists — or at least that’s the idea — in turn allowing artists to add as much or as little content (and complementary services around that content) as they need. With EvntLive’s goal of allowing users to watch concerts anytime, anywhere, the platform will launch with support for tablets and smartphones through HTML5 on mobile browsers and will add native apps down the road. The platform will offer live and on-demand concerts, some of which will be free and some of which will come with typical pay-per-view prices, Estrin says. Really, the goal is to not only give the user a platform-agnostic music channel, but a customizable music experience in which they can tailor their own viewing experience with different camera angles and feeds, for example. Each artist will have their own profile page, which fans can follow to find more information on their albums, their upcoming tour dates, and eventually the startup wants to allow users to buy tickets directly from their pages. Each concert will have its own event page as well, which will include streaming video, different angles and views, while allowing fans to engage in conversation during the feed, to drill down into more information on the band and plan meetups for after the show, for example. 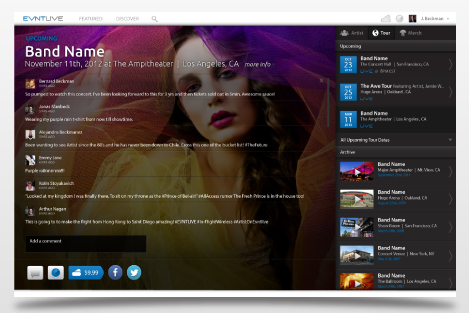 To complement its streaming options and provide more value, EvntLive also wants to become an archive for concert footage. So, while you’ll be able to go watch The Rolling Stones live from MSG, you’ll also be able to check out footage from past tours. Naturally, one is only willing to invest so much in the live streaming concert experience — both in terms of cash, money, flow and attention. I’m not going to sit in front of my laptop to watch a two-hour concert — at least not with any regularity — no matter how good the quality of the stream is. Instead, the more it’s able to build out a library of high-quality, on-demand concerts from top artists (and not just the last two shows), combine that with live top artists, exclusive content, and so on, the more stickiness the platform will have. 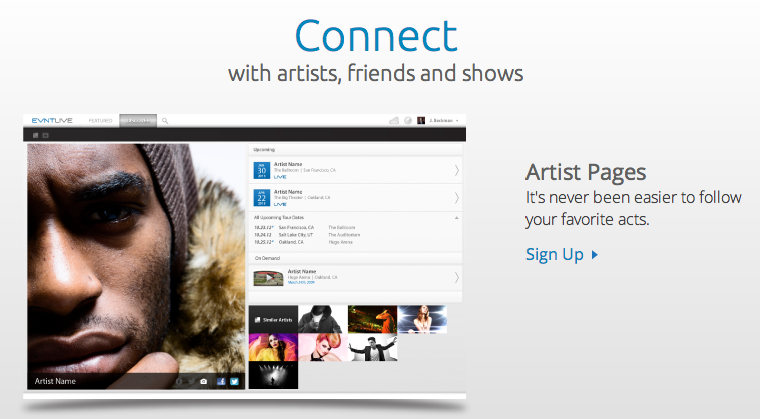 Plus, the more it can provide the synchronous, social experience of addictive music apps like Turntable.fm, allowing users to tweet, like and chat with their friends and others watching live shows or recorded footage, dig into artist data in an AllMusic-like data resource, follow and get updates and alerts on your favorite artists (when they’re coming to town for example), purchase tickets (for an actual live concert), the higher the value for the consumer. And, on the band side, artists are hungry for supplemental revenue channels and, with busy (or empty schedules) want better, easier ways to increase engagement and interest without having to manage this themselves. Not exactly their area of expertise — why they’re called “artists,” right? Partnering with third-party services that have already nailed the mechanics of marketing, etc., will be critical for EvntLive over the long-term. At the outset, the startup will be going after the big ticket names in music and the mid-sized bands or indie artists that can’t fill out big venues but have engaged, core fan bases already engaged to help it build awareness and brand recognition, but over time, Estrin sees it expanding to include the long-tail. The platform is currently in private beta, with a full-scale launch to come in the next few months. So stay tuned for more. Find EvntLive at home here.